I have decided to do as much of my own “wrenching” on my bikes as I can. Some things are a bit beyond me, yet. 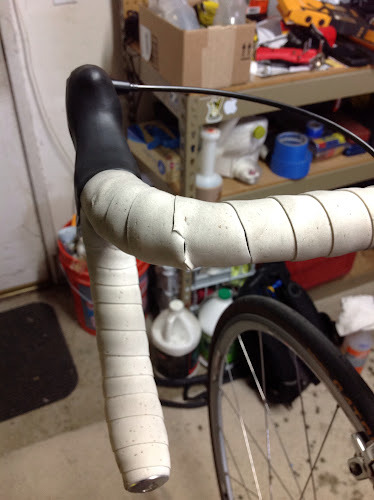 I won’t be doing any bottom bracket work, for example. 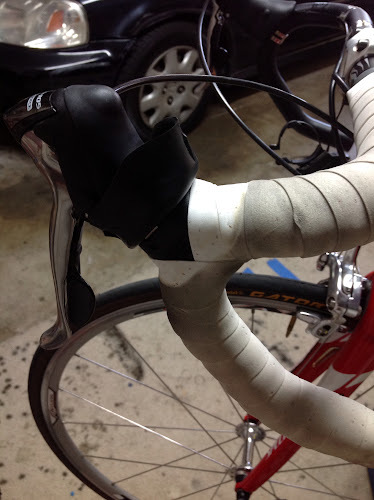 But, I decided I needed to re-tape my handlebars on my Allez. It’s funny to me because I’m finding out all kinds of new things that are like, duh! Like, people get their shocks serviced every six months to a year. Or, they replace the bearings and relube their hubs at least once per year. 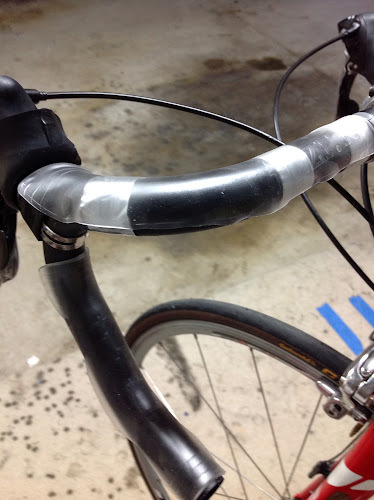 And, they replace the tape on their handlebars once per year, I guess. Now, this might sound weird, but I was scared to do it. For some reason, it totally intimidated me. I figured there was some arcane, mystical weaving method to it that I would completely screw up. But, there’s not. It’s not complicated at all. And, in an ideal situation, shouldn’t take more than an hour or so. 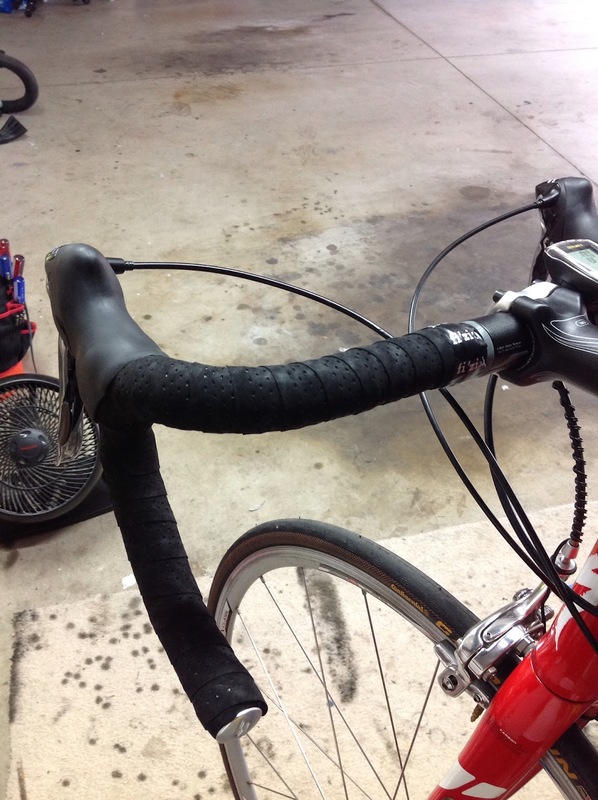 The tape on my Allez’s bars bugged me from the beginning. It was white. Maybe it looks good, but it’s a pain in my arse. Because, if I get a flat, or my gears throw the chain (which happened far too often) and I got dirt or grease on my hands, it would seem that I could never get them clean enough after. Inevitably, my tape ended up looking dirty. And, I couldn’t seem to clean the tape, either. Then, this happened. That piece of tape was always sliding over and exposing the bar beneath. Drove me crazy. I was always trying to pull it back over. Finally, the other day, it tore. So, I ordered some Fizik Microtex tape with gel. I also went on YouTube to watch some videos. Can I just digress a moment to say how much the Internet has changed my life? Even back in 2006 when I was working on my bike, I don’t think YouTube had as many videos for how to work on your bike. Now, you can look up almost anything! Then, there’s the Park Tools site. Why even buy a repair book (of which, I have two), anyway? So, this video was extremely helpful to me. Without it, I probably would have screwed it up way more than I did. So, far, I have done half of the bar. I did it last night, but it was getting late. It was bloody hot in the garage, too! Even at ten o’clock!!! So, I will try to finish tonight. I thought I would share a couple pics with you of the work, in case you’re interested. Yeah, that tape is a little dingy, huh? 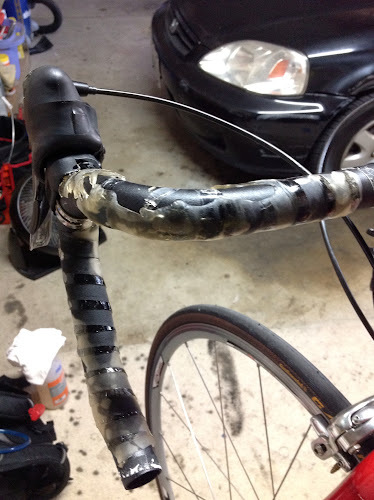 With the tape removed, I found that Specialized had added some kind of gel. It looked pretty bad, actually. KInda like snot, or ectoplasm. So, I removed that and the tape that still stuck to the bar. Finally, the bar was clean so I could start. I decided to even retape the brake cables. 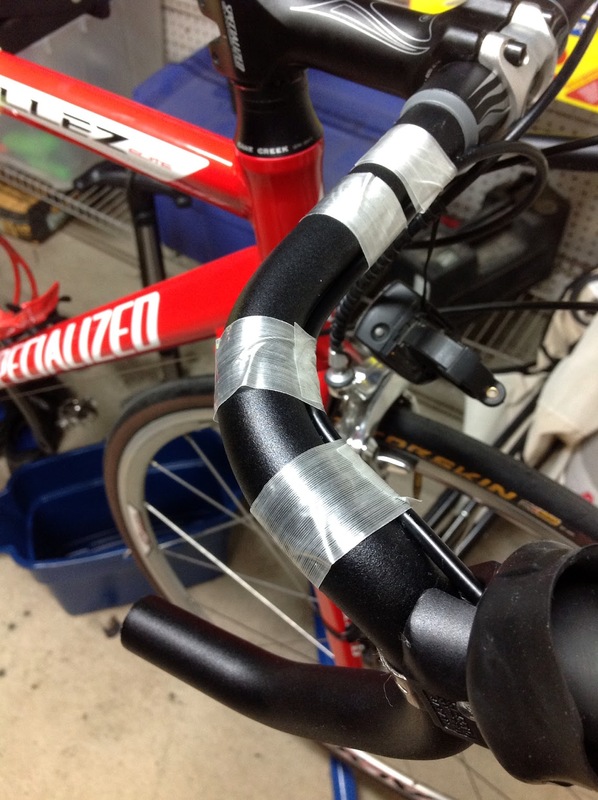 So, I did that with some “strapping tape.” Specialized had used some kind of thin, clear tape that looked cheap and left a nasty, gummy residue. 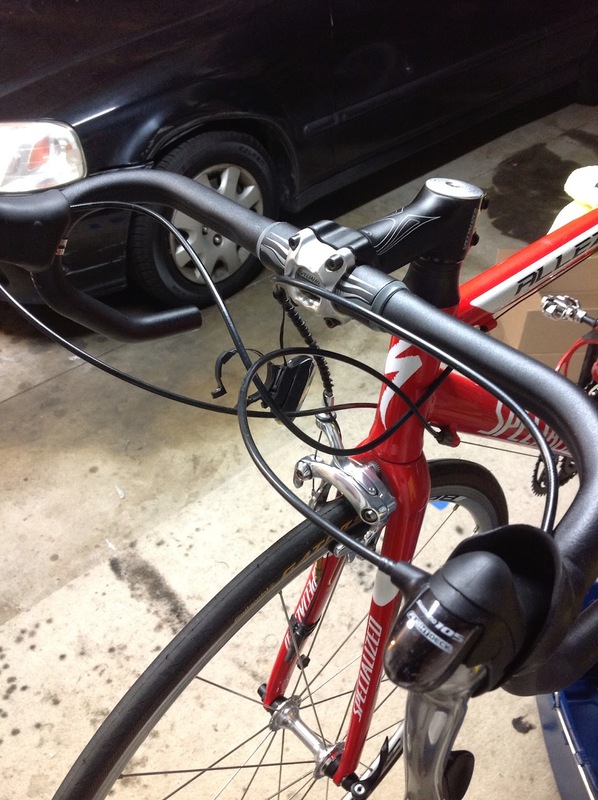 Here’s the bars with the strapping tape in place now. Much better. The bar tape I bought was well-reviewed and seemed to be a kind of gold standard for bar tapes. 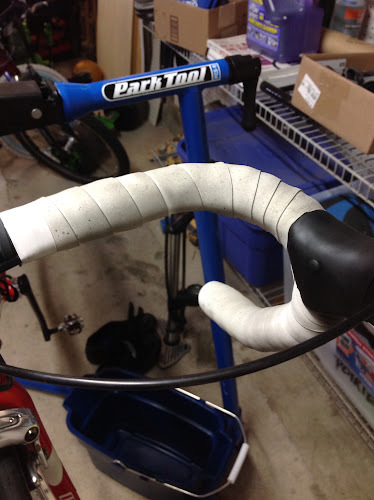 I also saw Cinelli’s cork tape and Specialized Roubaix tape get favorable mentions. But, this Fizik Microtex seemed to be the one I wanted. I chose to get the gel, too, even though that got mixed reviews. I didn’t know my bars already had some gel on them, so this well help make that consistent. I don’t know that the gel will make any big difference, but it seemed like a good idea. I think it looks good, but not great. I also got my new torque wrench and used it to properly tighten my carbon seat post which I inspected carefully and did not find any cracks. So, the Allez is in pretty good shape right now.